Besides being very fascinating neighborhoods, the Vatican City, Borgo Pio and Prati feature some of the most beautiful touristy spot in Rome: St. Peter’s Church, the Vatican Museums and Castel Sant’Angelo. They are well connected to the rest of the city thanks to A subway line and they can offer a vast choice of hotels, restaurants and shops. Don’t expect to find a vivid nightlife though: during the day the area is full of religious people, tourists, pilgrims. But at the night it turns into a quiet and suggestive borough, ideal for a nice romantic walk. Ideal if you plan to spend little time in Rome. San Pietro, Borgo Pio and Prati are ideal spots if you plan to spend only a few days in Rome and you want to maximize your time without missing out the city’s attractions. 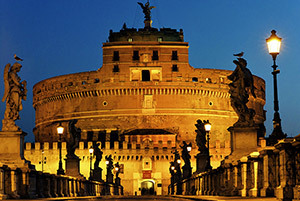 Here you can walk your way to St.Peter’s, the Vatican Museums and Castel Sant’Angelo. And you can take the subway and easily reach the historical downtown, the Colosseum as well as the oldest churches in Rome. Shopping. For shopping lovers, the hotspot is Via Cola di Rienzo, the commercial avenue that connects St. Peter’s to Piazza del Popolo. The street is filled with shops, most of which are franchising, such as Coin Excelsior, Furla. Max Mara and recently Tiffany too. You can find shops for all tastes, good food at Castroni and Franchi, with specialties that range from sweet to salty. Romantic walk. There’s no place better than Sant’Angelo’s bridge or Ponte Umberto lit by small street lights to whisper loving words to your partner. Whatever the circumstances are: a love declaration, a marriage proposal, or a confirmation of deep feelings, the beautiful landscape will give you a hand in reaching your goal. Pricey. Being close to the historical downtown and the main touristic attractions doesn’t help to keep the prices low in Prati. For this reason, at least during the day, you’d rather have something to eat on the fly either in a pizzeria to go or in one of many street food spots as opposed to sit down at a restaurant for a full meal. Hotels with no vacancies. The area is beautiful and central so it’s also very touristy especially during the religious festivities. Hotels may be full during those times. A good ice cream. Do you want to eat a good ice cream? In these neighborhoods you’re going to have plenty to choose from. If you want to stay close by we suggest Hedere, in Borgo Pio 179, homemade ice cream that uses fresh and seasonal ingredients, granitas, truffles and brioches. Otherwise you can take a walk up to Fata Morgana, in Via Bettolo 7, one of the best ice cream places in Rome, where you will find interesting combinations of flavours such as grapes and walnut, cheesecake, torta dobos and venere nera. It’s worth to go. Alternatively, you can go to Via dei Gracchi, to gelateria Dei Gracchi to try an excellent pistachio, The flavours vary according to the seasons. We recommend ricotta cheese and pear or figs and toasted almonds. Recently in Via Cola di Rienzo, you will find a branch of gelateria La Romana, where you’re going to have to get in line for cones covered by melted chocolate, and ice cream with whipped cream on top either simple or with chocolate or zabaglione. Fast and cheap meal. Street food places where you can have a meal with little money are popping up more and more in the city. This area is no exception. In Via delle Grazie, 5 you will find Pastasciutta, well known for its plates of pasta. You can sit or stand. The seats are few so you’re going to have a hard time sitting down. Prices vary from 4, 5, 6 Euros. Otherwise, in Via delle Grazie you can have a piece of pizza at Alice Pizza. This is a chain that has several points throughout the city. The dough is easy to digest, the toppings are excellent, the prices are a little above average but it’s worth it. Instead if you want a good sandwich, the place for you is Borgo 139. Over 20 different kinds of sandwiches with fresh ingredients and prices between 4 and 6 Euros. They serve also stuffed pizza and mixed salads. Cornetto by night. In Rome romans eat cornetti any hour of the day, even at night. In Via Barletta, 27, near Via Ottaviano, you will find Dolce Maniera cornetteria, open 24 hours. Traditional spot for roman youngsters, its appeal comes especially for the very low prices of its cornetti, sweets and pizzette available at any time. Don’t expect high quality though. The place is targeted to youngsters that go for a treat for little money. Covered Market. Not only seasonal fresh veggies and fruits. You can find all sorts of products at the market in Piazza dell’Unità. Thanks to the initiatives of local businessmen you can find clothing, accessories, handbags, jewelry, books, recycle-design items and street food. At lunch break Banchetto 26 makes sandwiches, salads, fruit salads, yogurt, sweets and cookies to go with great shakes and craft beers. Nightlife. In St.Peter’s, Borgo Pio and Prati neighborhoods nightlife is somewhat scarce. However, the neighborhood features the Alexanderplats, the best jazz spot in Rome. Also the Fonclea, a bar with live music and live shows. And finally the Auditorium Conciliazione that features concerts, plays, musicals, exhibitions and cinema shows. Subway. The fastest way to get there is subway, without a doubt. Take the A line and get off at Ottaviano – S. Pietro – Musei Vaticani. Bus. From Termini station you can take the 40 or the 64 (longer and slower route). From Tiburtina Station you can take the 492 that makes stops at Via Barberini and Largo Argentino, reaches Piazza Cavour and Cipro subway station.